​Raymond George Cook was born in Saul on 28 February 1895, the son of George White Cook and Ann Maud Long. He was baptised, along with his younger sister Thora Anne Niblett (who later married Milton Tudor) on 11 December 1902 at St James the Great, Saul, when the family were living in Church Lane. Raymond's mother died in 1904, and his father remarried a couple of years later; by then the Cooks' home was at Priding. By 1911, Raymond had followed his father to sea. On 31 August 1915 he volunteered for the Royal Naval Reserve, giving his address as Frampton for his father and stepmother had moved to The Street. Raymond reported to the training depot HMS Vivid at Devonport on 6 September, the same day as Archibald Edward Cook (from another family of that surname). Training for sea would normally have taken about three months, but as Raymond is recorded at Vivid for one year, he may have been retained as an instructor. In August 1916 he was appointed to the paddle minesweeper Halcyon at Lowestoft, and served on board for some six months before being posted to the minesweeper depot ship Island Prince, a trawler hired by the Navy, based at North Shields. Only two months later he was again transferred, this time to the similar vessel HMS Lord Lansdowne at Oban, possibly for service on the Ascot-class paddle minesweeper Doncaster. On New Year's Day 1918 he was posted to yet another Naval trawler, the Nesmar, again based at Oban where he was to remain until 22 June 1919; after the Armistice these vessels were kept very busy clearing both British and German mines from our coasts. During his time in the Oban area he was treated at Oban Cottage Hospital for a swelling, and also appears to have been charged with being asleep on watch, but he was nevertheless awarded chevrons for his service. Raymond Cook was also awarded the British War Medal and Victory Medal, but his service is not remembered on the plaque in Frampton Village Hall. Raymond appears to have been demobilised in June 1919, although the surviving records are unclear. On 8 November 1919 he was summoned for riding a bicycle without lights in Frampton but gave the police a false name and address. 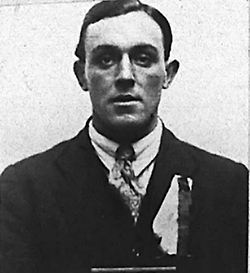 After extensive efforts to find him, he appeared before the Whitminster Police Court a month later, then a seaman of the SS John, with an address in Bristol. Magistrates took a serious view of his actions which they considered had greatly aggravated his offence, and fined him £2 with 1s. costs. An entry on his service record in June 1934 appears to be a request for a résumé of his Royal Naval Reserve service by Cardiff City Police. They were seeking information in connection with his forthcoming trial at Glamorgan Assizes 'upon several charges of housebreaking and bigamy'. Raymond's story is next picked up through his entry on the 1939 'census' when he was living at 7 Newport Street, Cardiff, working as a deck hand on a sand boat and married to Lily. It is likely that she was formerly Lily Clark and that their wedding had taken place in 1932 in the Cardiff area. On 11 November 1940 Raymond George Cook was the master of SS Skarv, a coaster working in the Bristol Channel to take sand from Nash Sands off the Glamorgan coast, when she struck a mine and the crew of five were lost. Raymond is commemorated at the Tower Hill Memorial, London, along with other men and women of the Merchant Navy and Fishing Fleets who died in both world wars and who have no known grave.